Martin O’Neill has come in for some heavy criticism following the Republic of Ireland’s failure to reach the World Cup. Denmark demolished the boys in green 5-1 in Dublin, casting the 65 year old manager’s future at the helm in doubt, with many reports linking him with the vacant job at Everton. However, despite this recent backlash, the boys in green have enjoyed some wonderful moments under O’Neill since his appointment in 2013. Here, we rank the top five. A rapid counter-attack, an excellent pass, and a clinical finish from James McClean. It was a professional, industrious smash and grab from Ireland in Vienna, against an Austria side boasting players like David Alaba and Marko Arnautovic. The Austrians (who had been mooted as potential dark horses for Euro 2016) were arguably the favourites to top Group D before a ball was kicked, but the boys in green gave the home side a reality check with an efficient away performance. Austrian defender Kevin Wimmer went down far too easily deep in the Irish half, and Wes Hoolahan played McClean through with a delightfully weighted through ball after being picked out by David Meyler, who impressed hugely off the bench in that game. McClean bore down on goal and blasted the ball through the goalkeeper’s legs with an excellent finish to seal three huge points for the visitors, and to spark early optimism about qualifying for next summer’s tournament in Russia. John O’Shea’s 94th minute equalizer against Germany at the Stadion Gelsenkirchen was a magic moment. Ireland were massive underdogs against the world champions in this Euro 2016 qualifier, but produced a typically spirited, determined display against Joachim Low’s side. The hosts dominated possession, and goalkeeper David Forde was forced into several smart stops against a German side who were smarting from a 2-0 defeat to Poland a few days earlier. Toni Kroos fired the world champions ahead in the 71st minute with a brilliant low drive from distance, and there seemed little hope of an Irish equalizer as the clock ticked down. However, in the dying seconds of stoppage time, Jeff Hendrick pulled the ball across the box, and John O’Shea hurled himself at the ball. The Sunderland defender, who fittingly earned his 100th cap on the night, flicked the ball past Manuel Neuer to send the travelling Irish fans into raptures. It was Ireland’s only shot on target, but sealed a famous result for O’Neill’s men, and was a far cry from Trapattoni’s last game at the helm, in which Ireland lost 6-1 to the same opposition. All eyes were on Cardiff. After disappointing results against Georgia and Serbia, the boys in green knew that anything less than three points in Wales would end their World Cup qualification hopes. Wales, who were without talisman Gareth Bale through injury, dominated early on before losing Joe Allen to injury. Ireland defended heroically, with Shane Duffy enjoying his finest game in a green jersey, and O’Neill’s side scored the goal which fired them to the play-offs in the 57th minute. Jeff Hendrick intercepted an Ashley Williams pass, before bursting down the line and cutting the ball back across the box. Harry Arter provided a clever dummy to allow the ball to bounce into the path of James McClean in the box. The West Brom winger found the back of the net with an emphatic right-footed volley, and O’Neill’s team held out to seal a play-off position in dramatic fashion. It was a performance that exhibited all the best attributes of the team under O’Neill, and had fans dreaming of the 2018 World Cup. A moment that will live Long in the memory, and just misses out on top spot in this list. Two substitutes combined to score a goal which will be forever embroidered in the tapestry of Irish football. Shane Long’s now famous strike against Germany at the Aviva handed Ireland an incredible 1-0 victory over the world champions. Darren Randolph – who took his chance on the night with both hands – found Long with a big punt upfield, and the Tipperary native took an excellent touch before smashing the ball past a static Manuel Neuer. Ireland held out for 20 minutes under considerable pressure, and the defensively sound performance, combined with a clinical finish, would become the blue print to beat superior teams moving forward (when successfully implemented). To take four points off the world champions in two competitive games is a remarkable achievement, and both matches will be remembered fondly by Irish fans for years to come. While Long has struggled for goals since his fantastic winner against the Germans, Randolph has cemented his place as Ireland’s undisputed first choice goalkeeper, and has been excellent between the posts for the boys in green. Robbie Brady’s celebration with his family. The reaction on the bench. After drawing 1-1 with Sweden (a game which included a sublime Wes Hoolahan volley) in the opening game of Euro 2016, and suffering a 3-0 defeat to Belgium in their second game, Ireland knew they had to beat Italy in their final group match to progress to the last 16 of the tournament. 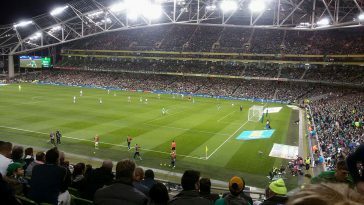 O’Neill made several changes for the do or die clash against the Italians – who fielded a weakened team as they had already sealed qualification – and Ireland produced an excellent performance under pressure. Wes Hoolahan came off the bench and missed a sitter with less than 10 minutes left on the clock. 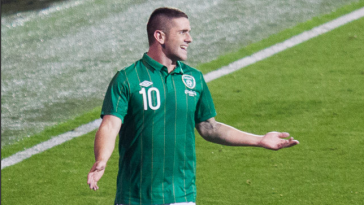 However, the Norwich playmaker atoned for his error with a superb cross into the box, which was met bravely by Robbie Brady, who headed the ball into the Italian net. It was a fantastic run by Brady, a world class cross from Hoolahan, and a famous win for Ireland. Brady’s header was one of those “where were you when” moments, and set up a clash with tournament hosts France in the knockout stages. Ireland would go on to lose 2-1 to the hosts after taking an early lead, but Brady’s header had Irish fans around the world dreaming.